Last week we reviewed a technique for ordering your workouts that provides a very user-friendly way for anyone to design and experience a full body muscle and cardio workout. The response has been great so today, we decided to review some other important guidelines so you can assure each of your muscle conditioning workouts is super effective. First off, the textbook correct way to train your muscles is to start with the larger muscle groups first and then finish with the smaller muscle groups. This means, for example, for your upper body you would perform all your back and chest exercises first, then finish with the shoulders, biceps and triceps. Basically, you would do all your full body, integrated movements first and then you can focus on isolating smaller muscle groups. If you don’t’ have a ton of time, focus on those compound movements like squats, lunges, rows, pulls, presses and pushes, because they use your large muscles as your primary movers and your smaller muscle groups still work to assist so you get the most bang for your buck! If your problem area is your upper body then perform your upper body exercises first when your energy is highest. There are many different ways that you could sequence your exercises in order to provide great results. The key though is that every 4-8 weeks you change the format you’re using. Using this design, you would switch back and forth from a lower body to an upper body exercise. With one set training, you quickly move from exercise to exercise never doing the same exercise twice. Using this design, you again alternate between a lower body and upper body exercise but this time, you complete 2 to 3 sets of each exercise before you move onto the next pair of exercises. Using this design, you pair exercises that work opposing muscle groups. For example, you would do an exercise for the chest and then an exercise for the back and repeat these for 2-3 sets before moving onto the next exercise. Using this technique, for each exercise you finish a set, then drop the weight by 10% and perform a few more reps to momentarily fatigue the muscles. If your goal is to try and get a cardio workout in also and/or lose body fat, try this workout. Perform one set of 4 different exercises then perform a 2-3 minute high intensity cardio sprint like skipping or stairclimbing. Continue this pattern for 40-60 minutes. For those of you wanting more intensity and volume, it may be necessary to split your body parts into separate training days. For example, you might perform lower body on Mondays and Wednesdays, Upper body on Tuesdays and Fridays and abdominals on Thursdays and Saturdays. Remember none of the above programming options is any better than the others. They all work wonderfully. The key is that you use a different technique every 4-8 weeks. Hope this helps put some method to the madness in the gym! 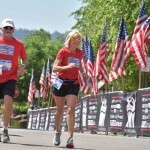 RUN TO REMEMBER WASHINGTON – Memorial Day Mile, 5k and 10k races! Saturday May 27th in Downtown Washougal, WA – just across the river from Portland Oregon. Let us honor the brave men and women who have or are currently serving in our Armed Forces and remember those who have given the ultimate sacrifice fighting for our freedom. This Memorial Day Mile and 5k/10k running and walking event on Memorial Day weekend will benefit Battle Buddies, an organization that provides Service Dogs for our Veterans.